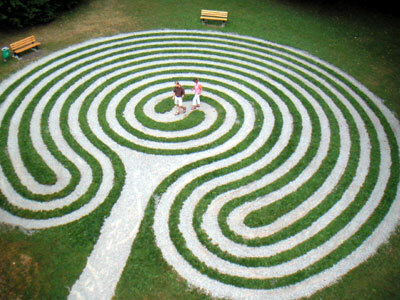 It is only a labyrinth if we accept walk-through labyrinths as such, since it has two accesses and no middle in which one can remain. I also use the German term “Wunderkreis” and not the translated “wonder/miracle circle”. 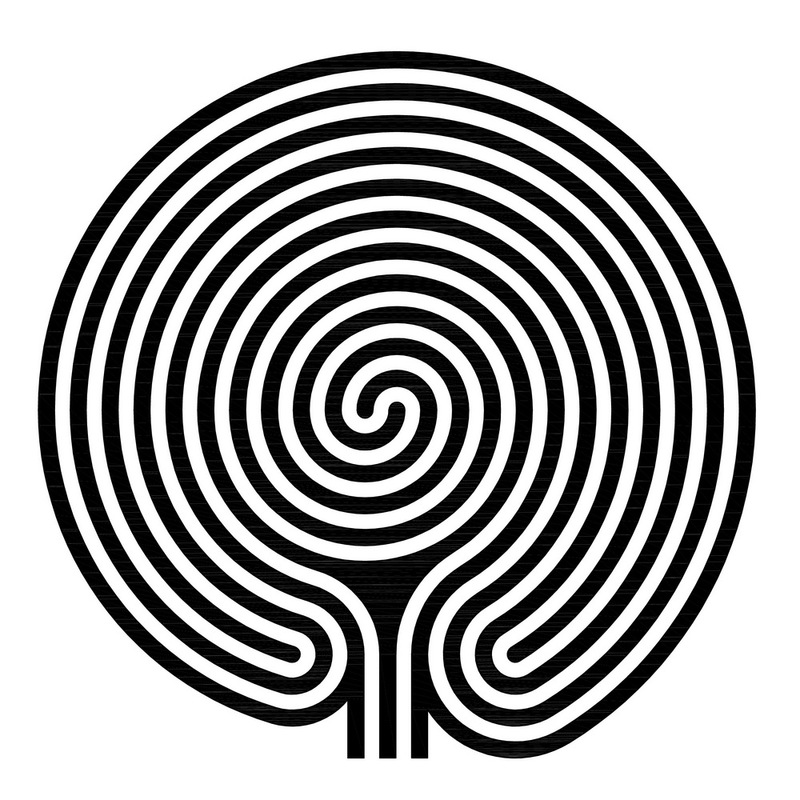 I consider it as a real labyrinth and even state that it has older roots than the Cretan labyrinth from the Mediterranean area. The activity with the Babylonian labyrinths brought me to this view, as there is a double spiral in the centre of a typical Wunderkreis. 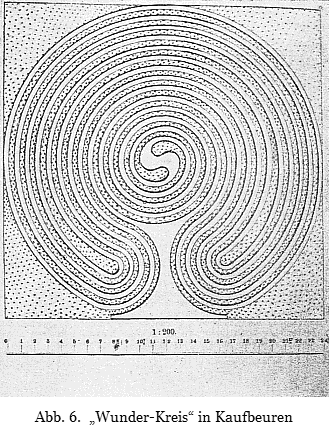 But a spiral alone does not make a labyrinth, meandering patterns are also required. This is a nice specimen laid with stones like the Scandinavian Troy Towns. The way runs between the stones. The entrance lies in the middle below and then branches out. I can go on to the left or to the right. However, I must wander through the whole figure to come out again. In the centre the determining change of course takes place. The two turning points around which the way is led pendulously, lie on the left and on the right side. I move towards the middle or sometimes away of it; sometimes I turn right and sometimes I turn left, as I do in a classical labyrinth. Two parts constitute the figure: the double spiral with the meander in the middle and the circuits around the two turning points. Which part will be run through first, depends on which way you choose. However, the two parts are not mixed, each element must be run for itself. The element with the two turning points, which form a triangle in combination with the centre in the double spiral, also appears as own labyrinth type, such as the type Knossos, the Baltic wheel and the Indian labyrinth. The Baltic wheel also has the second access/exit to the middle which is very short, however. The real middle is formed by a bigger, empty area. Nevertheless, it is not a Wunderkreis, because the second way alone does not constitute one, but the double spiral in the middle. In this drawing the paths rather than the walls are shown in black lines. 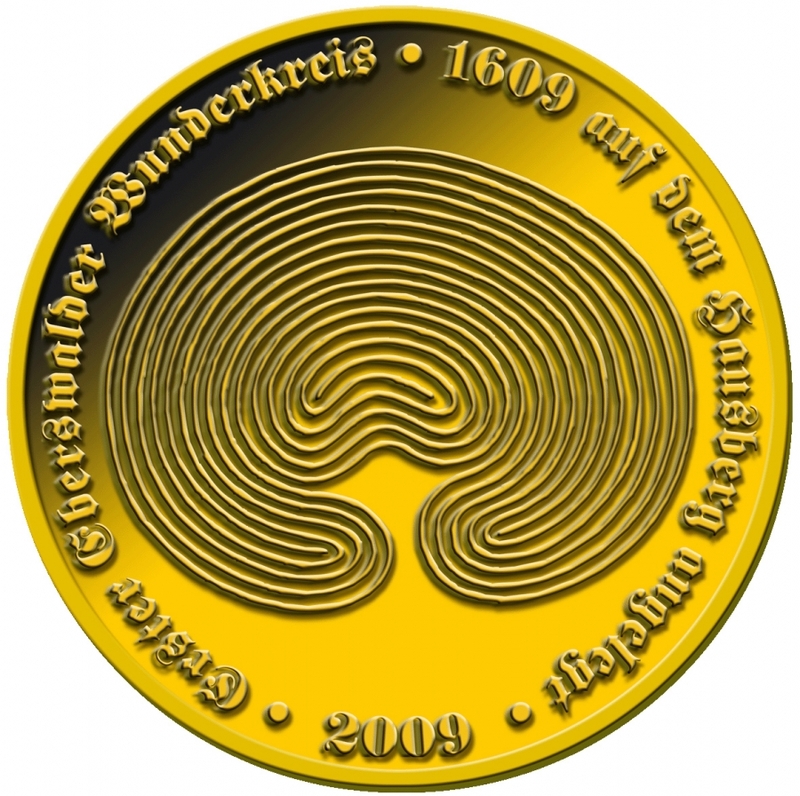 The Wunderkreis was put on first in 1609 and to the quartercentenary in 2009 even a coin was designed. Here the design looks a little bit different, nevertheless, the course of the path is the same as in the drawing. In the meantime, a Wunderkreis from paving-stones was put on again in Eberswalde. Not on the Hausberg like in 1609, but on the Schützenplatz. Another historical Wunderkreis is passed down from Kaufbeuren. A similar Wunderkreis has been put on in 2002 in the Jordanpark again. The Transylvanian Saxons brought new insights to the use of the Wunderkreis with the celebration of the march through it. The original Zeiden Wunderkreis still exists in today’s Romania. 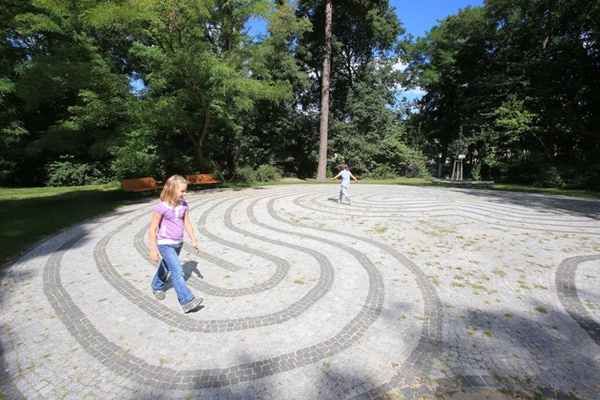 The Zeiden community have carried on the traditions round the Wunderkreis here in Germany so that we have learned more about that labyrinth. The lines here illustrate the way and first turn to the right. They also do not branch out, but run apart. Thus we can assume that the external circuits were traversed first and then the double spiral. 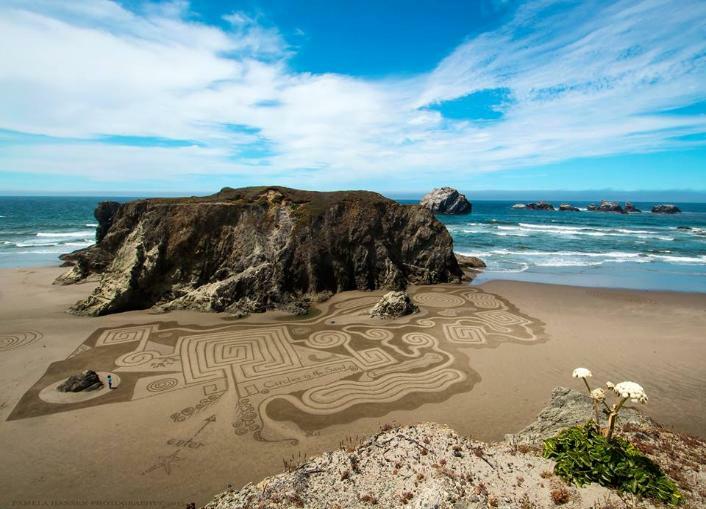 At quite a different place the following temporary Wunderkreis was built in July 2015 : At low tide on the beaches of Bandon in Oregon (USA). 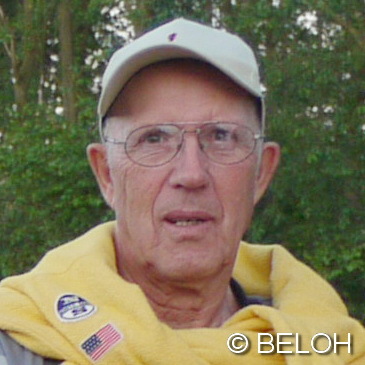 Since 2014 Denny Dyke and his team have put on new creations under “Circles in the Sand” in the Dream Field Labyrinths. Besides, he often uses the double spiral and the Wunderkreis which is particularly suitable for these as it is a walk-through labyrinth. It does not depend on the external shape, a Wunderkreis can also be angular. Now we can look at the most important features of the Wunderkreis in a sort of a blueprint. Here we have the limitation lines (walls) in black. We see four termini. The two entries are arranged side by side. 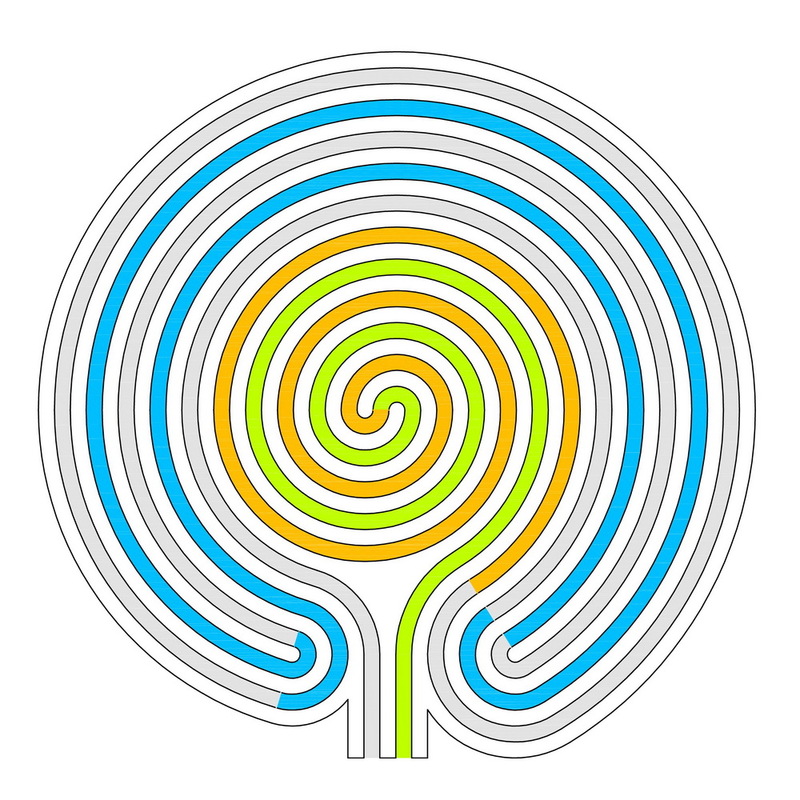 If we color the paths in different colours we can recognize better the essential components of this type of labyrinth. There are two different areas. If we enter through the left entrance we first surround the two turning points in the lower area in a pendular movement changing direction on every side. The way on the right leads into the double spiral. 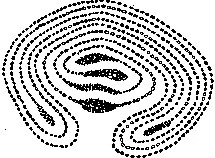 The initial movement in a processional labyrinth first leads around the outermost circuits. In the double spiral the most important change of course takes place and leads out from there again. The Wunderkreis was often used for competitions and even served as a sort of racetrack. Maybe the name can be traced back to this use as well. 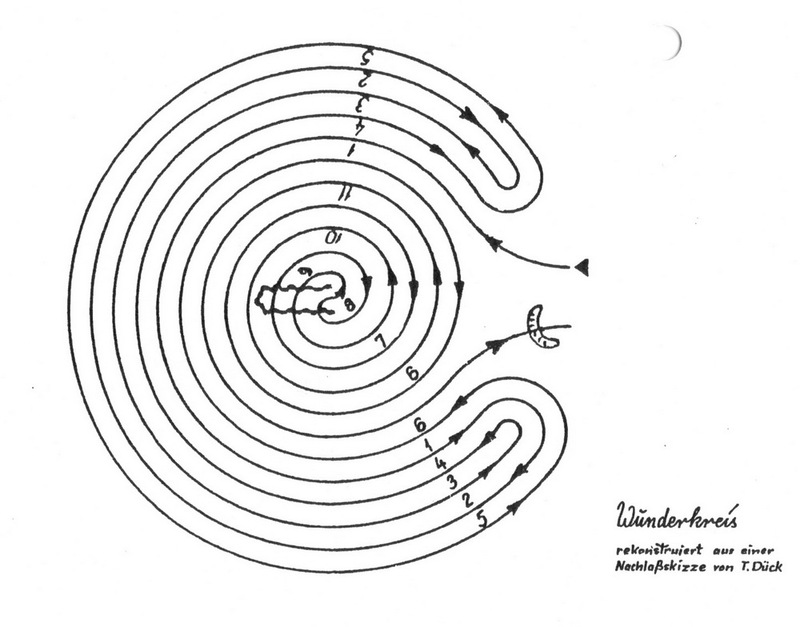 Hi Edwin – I am reading up on Wedding Labyrinths, and I guess they would all be variations upon this – the Wunderfreis? 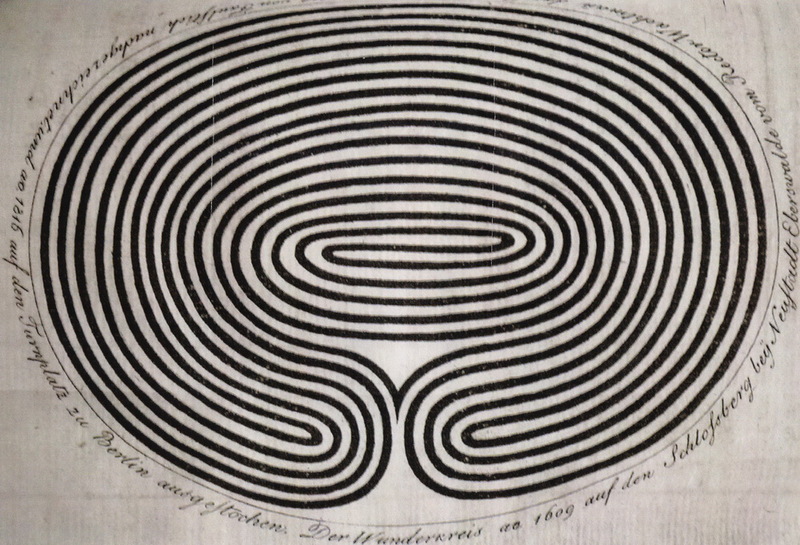 I am finding very few actual photos of the labyrinths themselves – but what I can find talks about two paths that come together in the centre. I confess, I am creating a blog post for my Marriage Celebrancy OPD and hunting through your blog to see if you have covered such a labyrinth! 🙂 Everything I have found elsewhere is a little fluffy! The work you have done on your blog is *amazing*, thanks so much for your dedication.